Underfloor heating (UFH) systems are not difficult to design or to install, but it is important that the guidlines and instructions are carefully followed to ensure that the system performs correctly once installed and has a long service life. This guide explains the fundamental principles and design of George Hannah UFH and also gives installation guidelines for the components and systems. Heating engineers familiar with installing conventional central heating systems will be accustomed to working with radiators, convectors and copper pipes. Installing UFH is different, although the heat source is often the same, the materials and method of heat distribution are different. 1. There is a central distribution point , the manifold , which is served by the primary heating source and which distributes warm water to the pipes of the UFH system. 2. UFH operates with a low water temperature flow and return and therefore requires its own water temperature controls and own pump. 3. UFH uses the whole floor area as the heating medium, replacing radiators or convectors. The design and use of one makers pipe system makes the installers physical task much easier. However, it is vital that the work is done correctly, as once the installation is complete and pipes are embedded in the floor, it would be difficult to make changes. The overall efficiency of the system is inherent in its design. The installer is solely responsable to the client for ensuring that the design and system criteria are followed. The system must be installed in accordance with the design and with other recommendations from the manufacturer. This guide is not intended to override the skills of the individual installer, it is simply published as a guide to installing UFH systems and is based on methods and practices developed over the years. It is hoped that it will provide a useful background on installation for those who are not yet familiar with the system. George Hannah are trained installers and we are available to install your UFH system. Technical support is also available from your system designer/supplier and will help with any queries if you have your own installer. However, it is important to note that the ultimate responsibility for the system operation rests with the installing company. Most UFH supplying manufacturers have a policy of continuous inprovement so some specifications may change without notice. Whatever the method used, the purpose of all space heatingis to create an acceptable level of human comfort within a defined area. 'Comfort' however, is a subjective concept. It will vary from person to person according to their age and activity level. There is therefore no universal ideal design temperature for all occasions - a sheltered housing project may require air temperatures of 21'C, while just 15'C may be adequate in gymnasium or indoor sports hall. The principles of UFH is very simple. Rather than mount metal panels on walls, pipes are laid in the floor and warm water circulated so that the floor effectively becomes a large radiator. Because the floor is so large compared to a normal wall mounted radiator, it needs to run only a few degrees above the air temperature to provide enough warmth to gently heat the whole room. The primary aim of the floor heating design is to create an even, uniform surface temperature across the entire floor area within the building in order to ensure a consistent comfort level throughout the structure. When the floor temperature is higher than the air temperature, the floor will emit mainly radiant heat. The heat output from the floor is directly related to the temperature of the floor and that of the surrounding air. Loops of pipes are normally installed beneath the whole floo area. These loops are connected to the central manifold, which is supplied with hot water from from a suitable heat source - such as boiler or heat pump - heat pumps becoming even more popular due to the potential energy savings. Usually, with boilers as the heat source, the central heating water is mixed before it reaches the manifold to reduce the water temperature to that suitable for the UFH system. Controls reduce the water temperature to maintain the correct design teperature and pump the warm water through the UFH pipes. UFH is a true radiant system and heats from floor to ceiling. UFH avoids wasted heat at high level and since the whole floor is heated evenly, optimum comfort is achieved everywhere in the room. 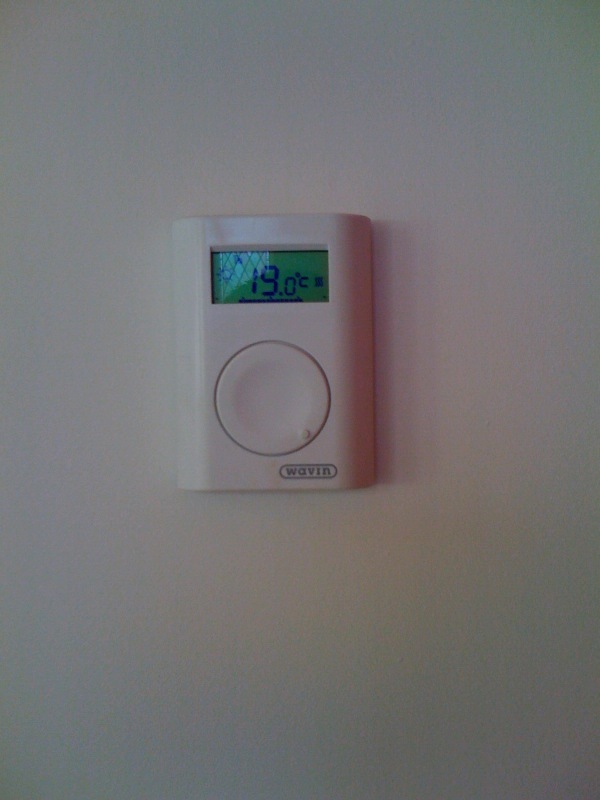 In fact, the room thermostat can be set 1 - 2 'C lower than a radiator system and the room will still feel more comfortable! Running the system at a lower temperature and reducing the heat wasted at high levels above head height makes for a significant savings on fuel costs. The exact savings that can be expected are difficult to determine, as there are operational factors that also need to be considered. It is the clients responsability to check that the heat losses of the building, carried out by a heating consultant or engineer, are compatible with the outputs given. Generally, the maximum output from an UFH system is often stated at between 70 and 100 W/sqm. The actual output is achieved is a direct relationship between the difference in floor surface and room temperatures. The floor construction, floor covering material, pipe size, pipe spacing, and the temperature of water circulating through the UFH pipes are major factors that determine the floor surface temperature. When designing conventional heating systems it is necessary to know the required heat output to be able to size the heat emitter. However, for UFH the size of the emitter is fixed - it is the floor area. Hence, the output is a function of the operating temperature of the floor, the floor area and room air temperature. Given the low U-values stipulated in current Building Regulations, it is unusual to require outputs greater than 70W/m2 based on a 20'C internal design temperature. It is important to note that poorly insulated buildings, conservatories, areas with high ceilings and rooms with high internal temperature requirements, may require supplimentary heating during mid-winter conditions. 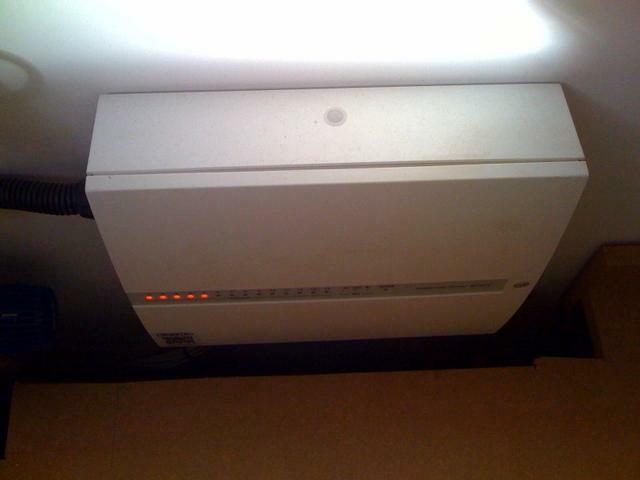 The heating consultant or engineer should provide heat loss calculations. Heat losses are calculated in the conventional way and the boiler size will be similar whether UFH or other heating system is used. Establishing the correct operating temperature for the floor surface is a balance between not having the temperature so high that it causes discomfort, but high enough so that sufficient heat output is provided to meet the calculated heat losses. BS EN 1264-2: 1997 states that the 'physiologically agreed' maximum floor surface temperature is 9'C above the room temperature. This results in a maximum floor surface temperature of 29'C in typically occupied areas with a room temperature of 20'C. A 9'C temperature difference will equate to a floor heat output of 100W / m2. Floor construction type is another key factor in design. Screed floors, suspended wooden floors and floating floors all require individual consideration to ensure optimum performance and an even distribution of heat across the surface of the floor. The screed or solid floor system relies on the conductivity of the screed or concrete to conduct the heat from the pipe surface to the underside of the floor finish. Because the screed is itself heated to conduct the heat it tends to store considerable amounts of heat and thus provides a slow response when both heating up and cooling down. Timber floor systems rely on the conductivity of components fitted within the floor to conduct the heat from the pipe to the underside of the floor finish. In order to achieve good results the pipes must transfer their heat evenly to the floor surface. Inadequate heat dissipation and hot spots can cause unsightly shrinkage, particularly with natural wood boards. Because the mass of timber floor structure is less than the mass of a screed floor, the system response of a timber floor system is usually much faster. The floating floor system is predominantly suitable for sheet flooring or some stronger laminates. The grooved insulation is structural and laid on top of a prepared base. Additional insulation may be required to ensure compliance with Building Regulations and to minimize downward losses. To meet the requirements of BS EN 1264, water temperature control must be provided. This ensures that maximum floor surface temperatures are not exceeded. Several makers have their own control systems designed to mix and control the primary heat source flow water temperature with the UFH return water temperature, to a requirement suitable for the UFH system. 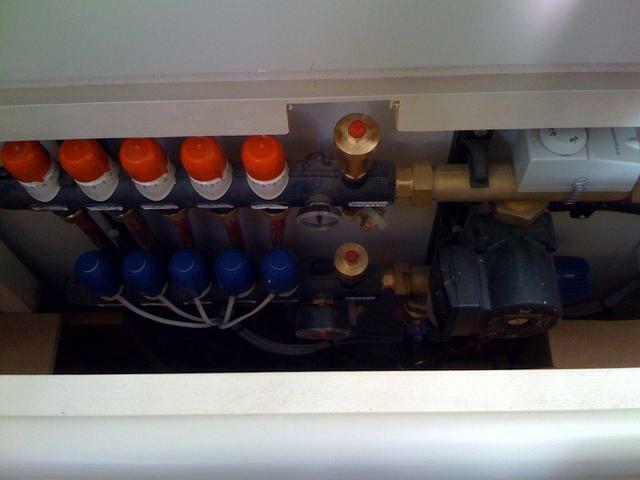 Traditionally, the primary heat source has been a boiler, producing low temperature hot water for the system. Modern high efficiency condensing boilers are ideal for UFH as the low water temperatures allow the boiler to work in condensing mode. If the heat source is able to provide and maintain a constant or variable water tempertature at the requirement for the UFH, it may not be necessary to have any further water temperature controls. If there are no services, other than the UFH, being supplied by the boiler and water temperature controls are used, it may be necessary to have a heat sink, such as a towel rail, prior to the UFH mixing valve to prevent the boiler from cycling and cutting out on high limit. However, ultimately, careful thought must be given when choosing your boiler, as not all units are compatible. Alwys check the specific application with the boiler manufacturer. More recently, other sources have become available which are ideal for UFH such as ground source or air sourced air pumps. The smooth inner surface of UFH pipes reduces the pressure loss, optimising the pipe length that can be used. The temperature drop across the pipe loop and the maximum required heat emission determines the water flow rate required through the pump. All manufacturers control packs are pre-assembled and supplied complete with a suitably sized UFH circulating pump. In solid screed floors and areas of average to low heat loss, George Hannah recommends standard pipe spacings of 300mm ( for 20mm diameter pipe ) or 200mm ( for 15mm diameter pipe ). In areas of high heat loss, the pipe spacing may be reduced by 1/2 the standard spacing to achieve higher heat output. Such areas include: highly glazed areas such as a conservatory, rooms with high ceilings, bathrooms with limited floor area and poorly insulated buildings. Tighter pipe spacings can also be used within a peripheral zone, which is an area of floor between an external wall and 1m in from an external wall. Pipe spacings may be reduced when renewable energy heat source, such as a ground or air source heat pump, is employed. In this instance, tighter pipe spacings will allow for lower hot water temperatures and result in improved efficiency and lower energy costs. Important Note: when calculating your pipe requirement, remember to add the feed/tail pipe lengths, between manifold and room, to your calculations. Where possible, the pipe should be laid so that the flow direction is to the coldest area of the room first, e.g: under windows, along outside walls. There are typically two patterns for installation in solid floors, the meander/sepentine pattern, or the bifilar/snail pattern. With the meander pattern the flow pipe is directed towards the window or cold part of the room before returning backwards and forwards across the room at the defined spacing. The bifilar pattern is where the flow pipe is run in at ever diminishing circles until it reaches the centre of the floor area, then it reverses direction and returns parallel to the flow pipe back to the starting point. Both patterns of installation are acceptable, however the meander pattern is often used against areas of high heat loss, while the bifilar pattern is employed where even floor surface temperature is required. For solid floor construction, a normal sand/cement floor screed can be used. No special additives in the screed are required. Where the pipe is laid on insulation, the minimum screed depth must be 65mm for domestic applications and 75mm for commercial applications as specified in British Standards. George Hannah recommends that the optimum screed thickness is 75mm but no more than 90mm, for most applications. Where heavier floor loadings are required, the construction engineer should advise on the screed thickness. Specialist Anhydrite (calcium sulphate) screeds, when used with UFH, must provide a minimum 30mm coverage over pipe or conduit. 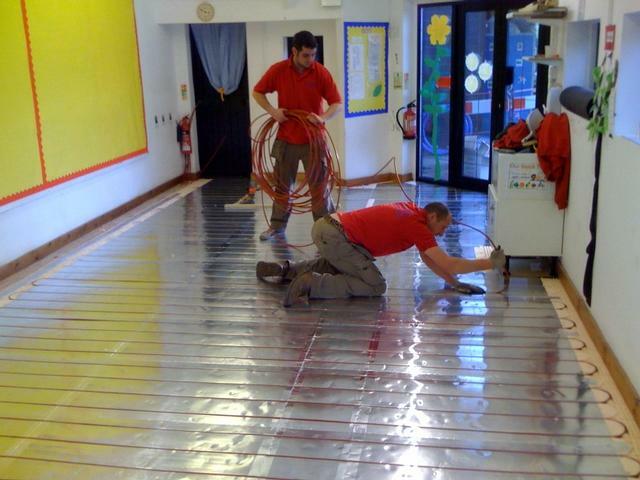 Careful consideration must be given to the expansion of heated screed floors. As a guide when using semi-dry cement and sand screeds, BS EN1264 - part 4 recommends a maximum screed area of 40 sq m can be laid without expansion allowances. With Anhydrite screeds much greater areas can be laid without expansion joints, eg: in sports halls up to 600 sq m. When using an Anhydrite screed always check with the supplier for their requirements. The screed must be allowed to dry and cure normally, in accordance with the relevent BS standards and manufacturer and supplier instructions, before initial heating and system start-up. The UFH must not be used to speed up the curing process. There are many types of wood flooring which are considered suitable for use with UFH and, equally, there are several methods of installing timber, which also must be taken into consideration before the system is designed. Particular attention must be paid to the moisture content of wooden floors. Not all timber floors are suitable for UFH and advice should be sought from the flooring supplier or from the trade association TRADA. A layer of insulation should be applied beneath the circuit pipe work to prevent downward heat loss, thus maximising the heat output into the room. It is also important to provide edge insulation around the perimeter of the area where UFH is installed, especially on screed floors, to avoid heat transfer/losses into the vertical structure. It also allows for an amount of expansion of the slab. Exposed Ground Floors: should be thermally insulated to the latest requirements or Building Regulations Part L and in addition, for UFH systems, should limit downward heat losses to no more than 10w / sq m. Supplementary insulation, above the normal Part L requirements, may be required if floor coverings with high thermal resistance are used. If insulation is already fitted below the concrete slab, a recommended minimum insulation thermal resistance of 1.25 sq m /KW should be installed above the slab to improve the UFH response times. Most floor coverings can be laid on UFH systems. The floor covering supplier should be consulted to ensure that any special recommendations are followed, eg: maximum temperature limits, wood drying conditions, special glues etc. It is strongly recommended that before any coverings are laid on screeded systems, the UFH system is run for two weeks (after normal screed drying times) and allowed to cool. In all cases , it is recommended that thick felts, thick underlays and cork are avoided. For optimum performance George Hannah advise that a maximum combined thermal resistance, for floor coverings, of 0.15sq m / KW is not exceeded, in accordance with the British Standard BS EN 1264, which equates to a carpet and underlay TOG value of 1.5. However, recent independant testing has shown that against current Building Regulations and reduced heat losses, a combined carpet and underlay TOG value of 2.5 is acceptable when used above a screed floor, although the underlay used should not exceed 1 TOG and must be suitable for use with UFH. We advise, where possible, to have masonary coverings, eg: ceramic floor tiles, slate, stone, marble etc. as this offers little thermal resistance and reduces downward heat losses. After the floor covering has been laid, the UFH system can be "tuned" to match the variations in floor coverings in each room by adjusting the manifold loop flowrates.